Whenever I’m planning to bake a cake, the Love of My Life chimes in with “An Orange Cake?” No dear, not everyone in this house loves Orange Cake more than any other cake in the world. Some of us like lemons and Chocolate! And then, if I choose to go with another flavour I always feel guilty. It’s silly, I know. How boring and totally unfair would it be if every cake I made was Orange flavoured? 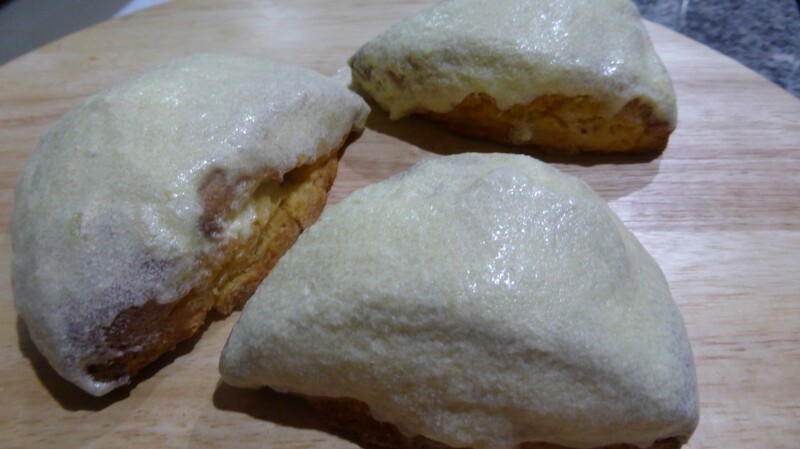 But when I saw these Glazed Orange Scones I knew Mr8 was going to proclaim me “Housewife of the Year”. They’re incredibly easy, very cute and extremely light. Mr8 and the kids devoured them and were very disappointed that this recipe only made eight. That’s only one each in this house. The only thing I have changed is the Orange Glaze. It just wasn’t quite right, and even though I used unsalted butter,the mixture split and looked curdled….YUK!! 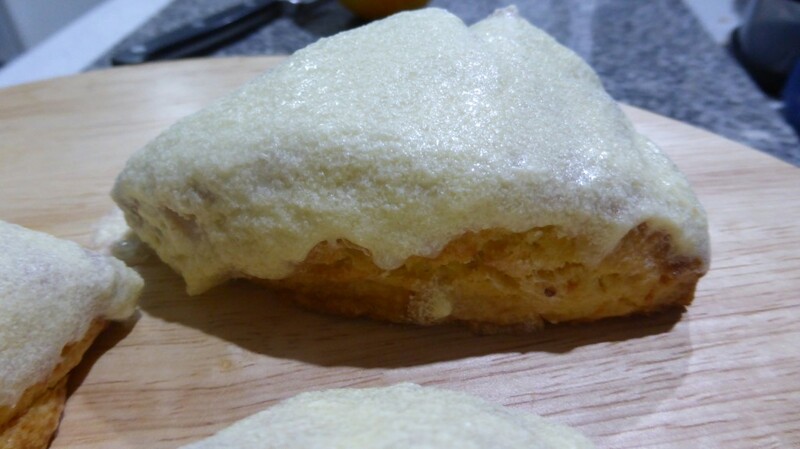 So I added heaps more icing sugar and Orange Juice until it looked just right. Kind of like slightly runny icing. Just don’t make it too runny or it won’t stick to your scones and will run right off all over the plate. And the scones are really too light to dip into the icing as suggested, I found they just fell apart, so I ended up pouring the icing over the top and letting it drizzle over the sides. Incredibly Yummy and a must-try for any morning or afternoon tea, especially if you’re needing to show off a little. In a medium bowl, combine the sugar and the orange zest, mixing together with your fingers until the sugar is moistened and fragrant. Add the flour, baking powder, baking soda and salt and mix until combined. Grate the butter into the mixture using the large holes on the grater and use your fingers to work the butter into the flour mixture as you would if you were making scones or pastry, until it resembles coarse breadcrumbs. Place the egg and the sour cream in a small bowl and whisk together until smooth. Using a fork, stir the sour cream mixture into the dry ingredients until the mixture comes together to form a large ball of dough. Place the dough on a lightly floured board and use your hand to shape it into a disc shape approx 2cm thick. 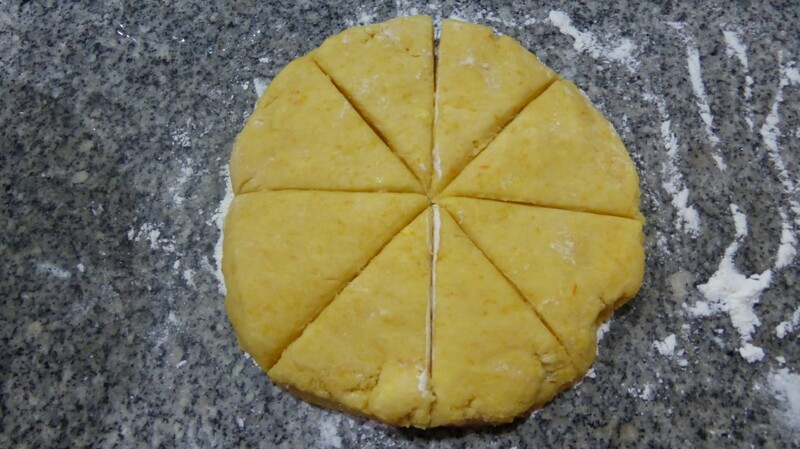 Use a sharp knife to cut the disc into 8 triangles. 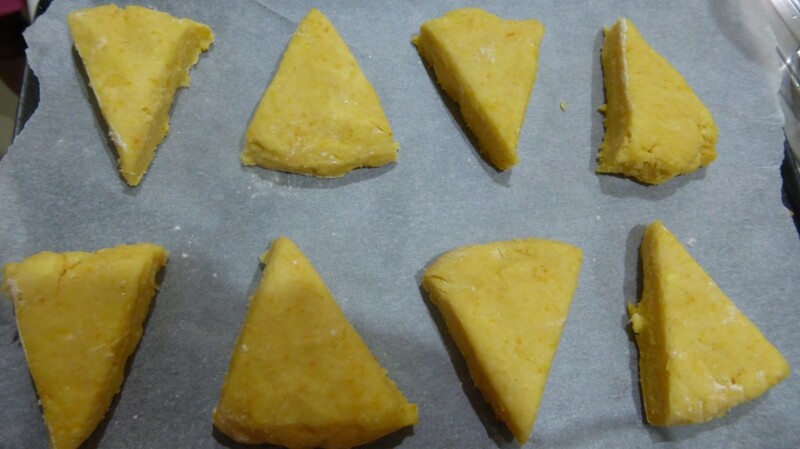 Place the triangles on a baking tray lined with baking paper and bake for approx. 15 minutes or until golden. Set scones aside to cool while you make the glaze. OK, this is the part where you are going to have to use your own judgement because I didn’t like the glaze in this recipe. In a medium sized mixing bowl, whisk together the melted butter, icing sugar, vanilla and 2 tablespoons of the orange juice. I continued to add about 1/4 Cup of icing sugar at a time and a little more orange juice until the glaze reached my desired consistency. Pour the glaze over the top of your scones allowing it to drizzle over the sides. If you wish you can use up all of your glaze by double glazing your scones. The more glaze the better in my opinion.